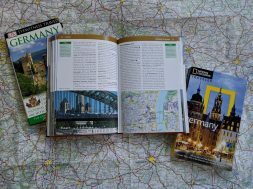 Home German Foods and Recipes German Fruit Flan Recipes – Make an Obstboden! 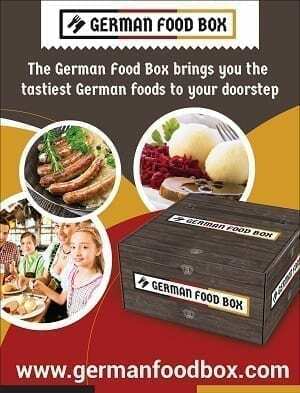 Looking for a traditional German dessert for that showcases all the delicious summertime fruits… but doesn’t take all day to create? 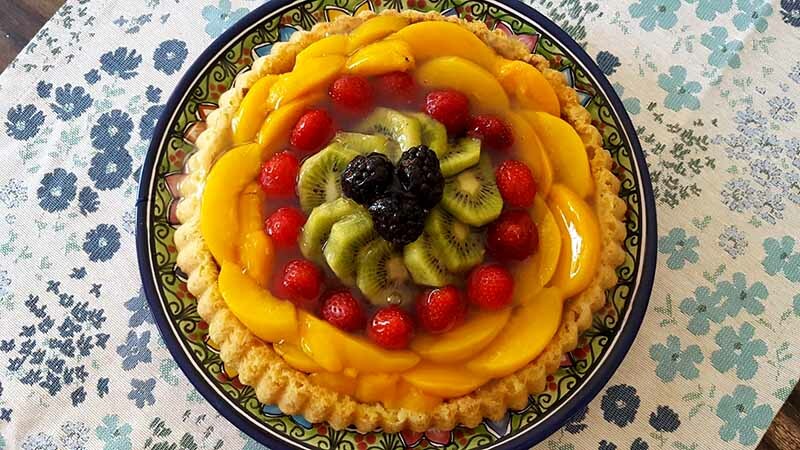 Try one of these German Fruit Flan Recipes. In German, we call them Obsttorte (Fruit Torte) or a Boden meaning Base… because the cake bottom is a base for any sort of fresh fruit you want to add. My mother made this cake all summer long… often as a second choice for a Kaffee Klatsch, because eating a lot of fruit on top of a bit of cake doesn’t really feel like you are over indulging, does it? Toppings for the German Fruit Flan or Obsttorte vary by imagination. I love any sort of berry, and here in the US, I tend to reach for Strawberries when they are in season, and maybe add boysenberries or blueberries. But don’t restrict yourself! Add Kiwi or Peaches! Make concentric circles of various fruits to give your simple Boden an amazing look. Be aware, some fruits are juicier than others, and you may need to add a protective layer to the cake part to prevent sogginess (I’ll explain below). Other fruits, like Bananas, are fine (if you happen to like bananas) but they will brown if you don’t take precautions. 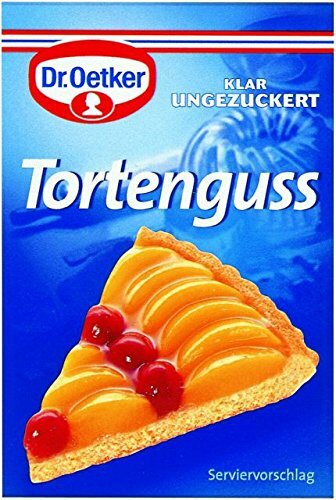 In Germany, most of the German Fruit Flan Recipes call for Tortenguß. 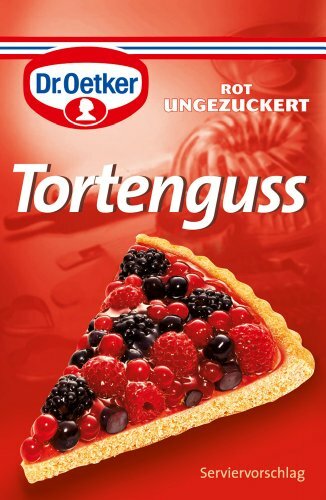 Tortenguß is a sort of “Gelatin Shield” that gives the cake a shiny look while protecting the fruit. Plus, it sort of holds things together. If you don’t want to use it, you can also use the seedless jam method for keeping the fruit shiny and safe. It comes in clear and red (to boost the color of those strawberries!). 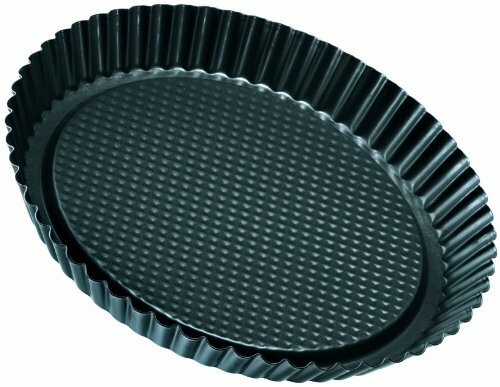 An Obsttorte or Obstboden is basically a cake bottom with a lip that holds fresh fruits. 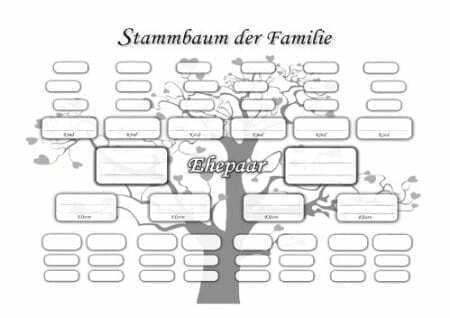 In English it's known as a German Fruit Flan. 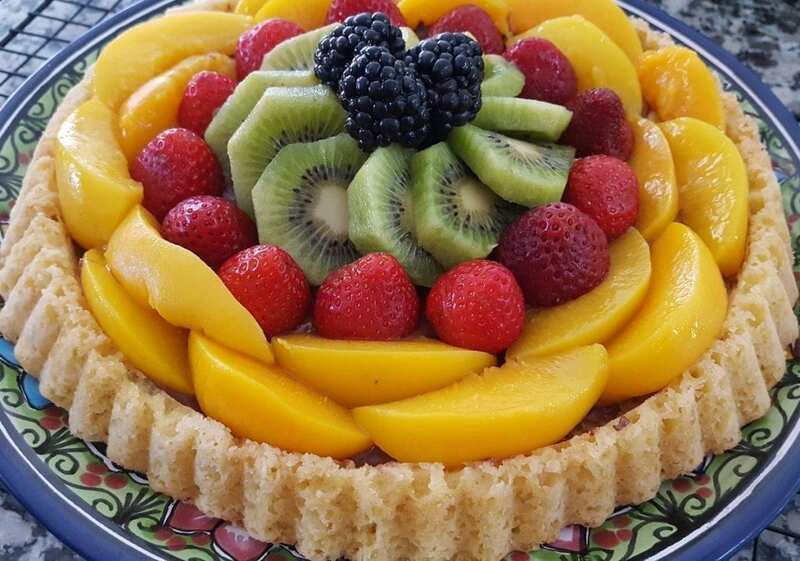 Because this cake is so incredibly versatile, depending on what flavors of fruit you like, or what is in season, I've included a few different German Fruit Flan Recipes and variations. Have fun with it! And don't forget... Serve this delicious cake with Home Made Whipped Cream! Combine Flour and Baking Powder in a measuring cup... with mixer on low, slowly add it to the creamed batter. Add milk if you used Vanillezucker. Spread the cake batter on the prepared pan with a spatula. It will seem like it isn't enough batter, but it really is. This cake does rise a bit. Then CAREFULLY remove from the cake pan. Decide on what fruits you want to use. Wash, peel and cut them (if needed) and dry them (I just lay the fruit on paper towel until I'm ready to use them. If you need to put a moisture barrier under your fruit, do so now. For a chocolate moisture barrier, melt 3/4 to 1 cup of Chocolate Chips, then spread evenly on the cake (up to the lip). Let set a few minutes, then add fruit. For the Pudding Powder barrier, just sprinkle a few teaspoons of pudding powder (or cornstarch) on the cake... then add fruit. For the Pudding barrier... make vanilla pudding, then spread a cup of it across the cake. Top with fruit. Top the cake with fruits. If you are making a pattern, it's easier to make it look right if you go from the outside rim to the center. You can mound it if you want. There is a list of fruits I like to use at the bottom. This recipe is for an 11 inch German Flan pan. I've included as many alternatives for an American Kitchen as possible, but this is one thing you can't work around. Say NO to Soggy Bottoms! Keep in mind, you can bake the cake part of the German Fruit Flan a day ahead (just wrap it up airtight to keep it from drying out). Assemble closer to when you serve it, and it should be fine. Still, if you are planning to use juicier fruit like Peaches or Kiwis? Or maybe canned Mandarins or other canned fruits. Be sure to drain them completely, and pat them dry with a paper towel before placing on the cake. But you can also protect the cake layer in one of a few ways. 2. Make up some Vanilla Pudding, let cool, and then spread it across the cake, just up to the edges, about 1/3 inch thick. 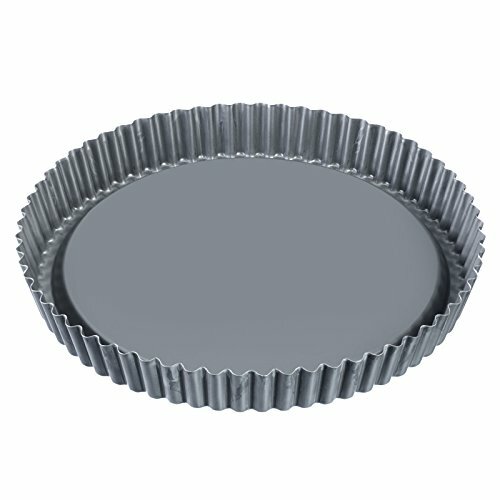 This will keep the cake from getting too soggy from fruit juice… and it will also add a nice vanilla flavor and soft pudding texture to the middle of the bite. 3. My Oma’s method. Sprinkle some Vanilla Pudding Powder or Cornstarch over the baked cake, before adding the fruit. The powder will absorb some of the moisture. If you want to use Bananas…. Slice the peeled banana, then toss gently with a little bit of lemon juice. note… I’m not crazy about using apples in this cake, they are just too crunchy. Sliced pears might be ok, but you have to worry about browning if you use fresh ones. 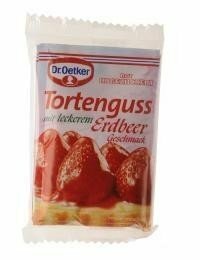 Note… Dr Oetker is unsweetened, so you have to add your own sugar (this is a good thing). Also, they’ve added a strawberry flavored Guss, which is kind of interesting, but I haven’t tried it yet. Spread the Batter to the Edge of the Pan…It will feel like there isn’t enough, but there is. Bake 20 minutes, until golden brown. See how it rose up? Let cool for 5 minutes, then carefully remove from the pan. 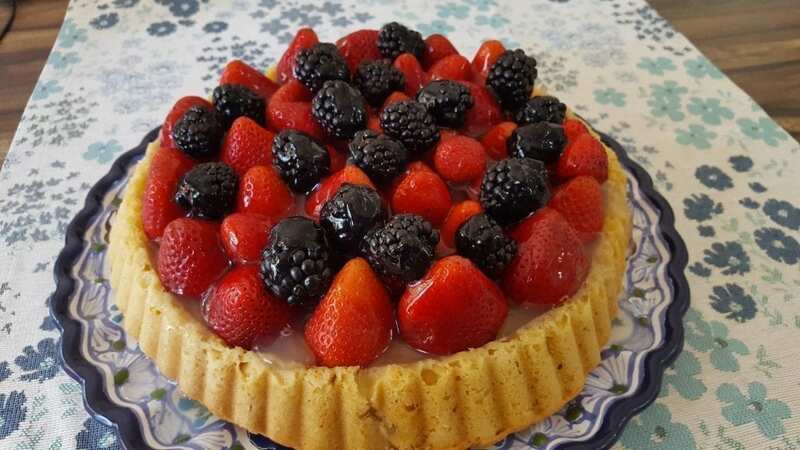 Just using Berries?… go ahead and line or pile them into the cake… outside in.